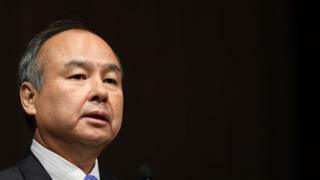 The head of Japanese tech group Softbank has condemned the murder of a journalist by Saudi security forces, but said his company must continue to work with Riyadh. In his first public comments since Jamal Khashoggi was killed, Softbank chief Masayoshi Son said his firm had a "responsibility" to the Saudi people. Saudi Arabia is the major investor in Softbank's $93bn (£71bn) Vision Fund. The Vision Fund helped the Japanese firm post a jump in quarterly profits. The fund, which holds investments in WeWork, Slack and Nvidia, is an investment vehicle focused on emerging technology. But global outcry over the murder of Mr Khashoggi last month put Softbank's close relationship with Saudi Arabia in focus. Mr Son was among a string of executives to withdraw from an investment forum in Riyadh last month in the wake of the journalist's disappearance. "It is true that a horrible incident happened," Mr Son said on Monday. "On the other hand, we have a responsibility towards the Saudi people, and we must carry out our responsibility rather than turn our backs on them. "These funds are important to the Saudi people in ensuring their economy diversifies and is no longer dependent on oil." The comments came as Softbank delivered an earnings update, with a sharp rise in first half net profit to 840bn yen (£5.6bn) from 103bn yen in the same period last year. Mr Son founded Softbank and has guided it to become one of the world's biggest technology companies. The Japanese entrepreneur is known to have an eye for firms with big potential. He was an early investor in Alibaba and saw the potential in e-commerce before many others. Self-driving technologies have attracted recent investment from Softbank, including GM's autonomous unit Cruise and a partnership with Toyota to develop transport services using autonomous vehicles.